Catamaran design and construction is old enough for the raw edge of experimentation to have been blunted and young enough for it to still hold some mystique. Misconceptions and half-truths abound about the way a multihull deals with the stresses of wind and water. I asked two catamaran experts to clarify some of them. Pete Melvin of the multihull design firm Morrelli & Melvin has over 25 years experience designing a variety of cats from Dennis Conner’s controversial 1988 America’s Cup winner, Stars & Stripes, to custom and production cruising catamarans, including the Gunboat 48 and 62 and the Moorings 400. Simon Slater was the chief designer and president of PDQ Yachts. Why are catamarans so weight sensitive? Slater: It all comes down to drag caused by wetted surface. The most efficient shape for a hull in terms of wetted surface is a hemisphere. The hulls of a catamaran, however, require a long, skinny shape. It is advantageous to avoid excess weight in cats because as weight increases, the long, skinny hulls sink relatively lower into the water than broad-beamed hulls. This results in a disproportionate increase in wetted-surface area, which increases surface drag. Monohull performance will not suffer from overloading as much as a cat will because the hull is closer in shape to a hemisphere. However, it’s important to point out that surface drag affects a cat’s speed only in lighter winds; the adverse affects dissipate as wind speed increases. Melvin: Since most of our cats are performance oriented, we are always looking for ways to save weight. Keeping the weight down creates a spiral effect of positive results, just as increasing weight gets the spiral going in the other direction. Less weight improves a cat’s speed potential and motion through the water and reduces overall loads. Reduced loads mean you can build the boat lighter. But every boat is a compromise, and the challenge of cruising catamarans is to find the right compromise between light weight and cruising comfort. What are the main structural considerations on catamarans? How do they differ from monohulls? Melvin: Engineering the hull laminate of a monohull or a cat is very similar. You design a laminate to withstand the pressures exerted by hydrostatic and slamming loads. These pressures are similar for similar-sized monohulls and catamarans. 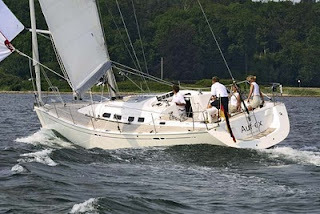 The transverse structure of a catamaran encounters some loads that are not present in a monohull. The two hulls need to be held together and resist a variety of forces that are trying to move them relative to each other. The main forces to contend with are those created by mast compression, plus the bending and torsional loads created by one hull trying to rotate relative to the other when one hull is on a different wave than the other. Designers normally incorporate a set of transverse beams or bulkheads that span across the catamaran and are firmly anchored to both hulls. On a cruising catamaran, there is typically one bulkhead under the mast and at least one other that spans across near the aft end of the boat. Slater: We use finite element analyses to determine material requirements in heavily loaded areas, such as the front crossbeam, the mast support, chainplate locations, and the mainsheet traveler support on the hardtop. With these analyses we can build a beam that weighs only 350 pounds but will withstand 60,000 pounds of loading. We calculate how strong the main transverse beam must be to withstand compression loads, how the hull sides must be reinforced to dissipate shroud loads, and how to carry the mainsheet loads down from the traveler on the coachroof to the aft beam. How important is bridgedeck clearance? Melvin: It all depends on how you plan to use the boat. Bridgedeck clearance is not as critical on smaller coastal-cruising cats that don’t go too far out into the big bad ocean, but on offshore boats that will be subjected to big seas, higher bridgedeck clearance is essential to minimize pounding. We look for bridgedeck clearances on cruising catamarans to be between 4 percent and 6 percent of the length of the boat off the water. This height simply makes it easier for waves to pass harmlessly between the hulls rather than pounding up underneath the bridgedeck. As well as having suitable bridgedeck clearance, a cat should have underbody surfaces that are relatively smooth. Slater: All cats will pound from time to time, especially in steep chop. The critical design factors to consider to reduce bridgedeck slamming are bridgedeck clearance, rig weight and height, bow shape, and keeping the weight out of the ends of the boat. The combination of these factors in correct balance will give a much smoother running boat and give far greater levels of comfort. As anyone who’s experienced catamaran pounding can attest, it’s an unpleasant, nerve-wracking experience. Higher bridgedecks reduce pounding. Less pounding is faster, minimizes structural stress, and, most important, makes for a much more comfortable ride. It should be realized that the designed height of the deckhouse and topsides will be relative to the bridgedeck height, so it is important to balance “sleekness” against the consequences of insufficient bridgedeck clearance. How do sophisticated design tools and construction materials benefit cruising catamarans? Slater: The desire for greater luxury and comfort makes the integration of weight-efficient design and construction critical when creating a catamaran. Cutting-edge design tools and lightweight materials create the foundation for a vessel that will deliver first-rate performance and ice for the gin and tonic. These luxury cruisers will never win a race against PlayStation, but they will perform decently while providing substantial comfort. Melvin: What materials you choose depends on what the cat is intended to do. If super-high performance is a high priority and you are willing to pay the price, building a boat with carbon fiber and other exotic materials can reduce overall weight and increase sailing performance considerably. Many fiberglass cruising cats can be light and fast—it’s just that a cat built with lighter and stiffer materials will be lighter, faster, and more expensive. What factors are involved in designing a cruising cat’s underwater profile? Slater: Start with a length-to-beam ratio for the hull of at least 11 to 1. This is tougher to do in smaller cats, but becomes increasingly easy to achieve as a cat gets bigger. From that point a shape that looks elegant will, in all likelihood, perform well. Because water is so dense, changing the boat’s course quickly uses large amounts of energy. In other words, when designing any shape that runs through the water, the water should not be surprised at the direction that it is being asked to take. I believe that keeping the transoms relatively narrow and maintaining as flat a run aft as possible are important factors in design when I am considering this “no-surprise” rule. How do the beam-to-length ratio of each hull and centerline-to-centerline beam affect a cruising cat’s stability and performance? Melvin: The heavier a cat becomes, the wider each hull needs to be. But performance improves as the hulls get longer and skinnier. The same holds true for centerline-to-centerline beam (the overall beam measured from the centerline of each hull). Long and narrow is faster than short and wide. The narrower you can design the boat (while preserving overall stability) allows the boat to be lighter, faster, have a better motion, and so on. Slater: The issue of the length-to-beam ratio is partially answered in the previous question. To understand, let us be extreme and say that a hull that is as wide as it is long would be really slow. We intuitively realize this. The opposite is not so intuitive until you realize that a hull that is, say, 100 times longer than it is wide will develop huge amounts of surface drag. These days we need to install equipment on cruising boats that was historically not even in the market for the relatively small boats we are talking about. Lightweight diesel generators (300 pounds), air conditioners (100 pounds), inverters (60 pounds), battery banks (200 to 300 pounds), and wiring harnesses around 130 pounds are now the norm. This obviously puts constraints on how relatively skinny the hulls can get and still float all this stuff. Increasing the distance between the hulls provides greater transverse stiffness but must be limited to what is practical, considering the handling, docking, and haulout issues associated with congested waterfront real estate. Additionally, wider bridgedecks carrying accommodations suspended above the water increase the weight load carried by the hulls. What’s the difference between keels and daggerboards? Slater: Daggerboards give the best speed and fixed low-aspect-ratio fin keels are the most convenient—it’s that simple. The boards are going to give better performance to weather and off the wind (they can be retracted to reduce that dreaded wetted surface), but they add quite a bit of weight and complexity to the boat. Fixed fin keels are not as efficient to weather and add wetted surface off the wind. They do not need to be controlled or looked after and can generally withstand a bigger wallop than a daggerboard. Additionally, they usually add to the buoyancy of the boat (and they do not require trunking in the accommodation spaces). It’s clear that catamaran design and construction is both art and science, and that designers and builders strive to make effective compromises. If the designers have done their homework and the builders have carefully controlled weight without adversely affecting strength and stability, the boat will be a good one. Next articleCape Cod Circumnavigation on a F-24 Trimaran?